We’ve sure been enjoying our comfort food dinners and leftovers this week. For this recipe that we had the last couple days, Southern Macaroni and Cheese, I’m going to send you back to Sweet Tea and Cornbread. This version has some unusual things I wouldn’t have thought to put in my mac and cheese, but they mesh together and create such a perfect taste that it takes this American staple to a whole new level. 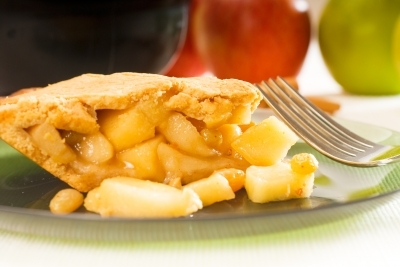 For dessert, nothing says comfort food like good old-fashioned apple pie. I don’t measure anything, but basically what you do is, mix up a bunch, and I mean a bunch, of peeled, cored, sliced apples with real generous amounts of white sugar, brown sugar, a couple heaping tablespoons of flour, about a teaspoon of cinnamon, dashes of nutmeg and salt, and a good splash of lemon juice. Feel intimidated? 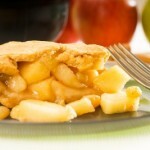 Just taste the apple mixture and adjust the flavors how you want it. Put it in a pie plate lined with pie crust. The reason you want a bunch of apples is that you want to mound it up pretty high. It’ll shrink some during baking. Dot with butter, cover with the a top crust in which you cut some steam vents, and then paint the top with cream or half and half and sprinkle white sugar on it. Bake at 375 for 45 minutes to an hour. Let cool for at least an hour to give it time to gel. Good fall eating! Another yummy Comfort Food Week dinner to report. Chicken noodle soup is an old American favorite, and this particular recipe, Silky Chicken Noodle Soup, is THE best in my family’s opinion. For this recipe, I’m just going to send you to my favorite food blog Sweet Tea and Cornbread. I make it exactly as they say. For dessert, nothing says comfort food like bread pudding. Here’s our favorite, Caramel Bread Pudding. Mix melted butter and brown sugar in bottom of 9 x 13 baking pan. Place a layer of white bread on top. Mix eggs, milk, and vanilla and pour half of it over bread, then sprinkle with cinnamon and nutmeg. Repeat layers. Bake at 350 degrees for about 30 minutes. What are your favorite comfort food recipes? Where I live we’re having crisp, cool autumn days now, which makes me think of nice, warm comfort food. So I announced to my family that this would be Comfort Food Week, and I picked out some of my favorite recipes to have for dinner this week. The first day we had Salisbury steak and mashed potatoes, with salad and rolls, followed by homemade, from-scratch banana pudding. Yum! I made enough to last two nights, so we won’t actually be having seven days of different things. And it was so good, it’s nice to be able to enjoy it for two dinners. Combine 1 1/2 pounds of ground beef, a small chopped onion, 1/2 cup bread crumbs, 1 egg, 1 teaspoon seasoned salt, and 1/4 teaspoon pepper. Form into 8 patties, cook in a couple tablespoons of oil till no longer pink, and drain. Mix together and add 2 cans beef consomme, 1/4 cup cornstarch, 4 teaspoons Worchestershire sauce, and 1/2 teaspoon basil. Cook and stir till gravy is thickened. For my mashed potatoes, which is pretty basic and I don’t need to tell you that, I had a used-up bottle of Ranch dressing that still had a coating of dressing in the bottle that I didn’t want to waste. I poured about a half cup of milk into the bottle, replaced the lid, and shook it up really well, then poured that into the potatoes and whipped them. Great flavor. I like my banana pudding with meringue on top instead of whipped cream, and here’s a link to a recipe like mine. Good stuff right there! Often lunch at our house is microwaveable frozen dinners, chicken nuggets, spaghetti-O’s, and such. Don’t try to tell me that public school lunches are more healthy! But I am not going to cook at lunchtime and again at dinner. But it really is possible to break away from the usual without too much effort, so here’s some things that have been popular lunch offerings for us. Using the recipe found here, you can make several mini pizzas that can be frozen ahead, then popped in the oven and cooked just like a freezer pizza from the store. Between two flour tortillas you can put grated cheddar cheese and whatever leftover meat you have, or canned chicken or turkey, chopped green onions (optional), and then heat both sides in a non-stick pan tilled browned. Cut into six wedges and serve. Heat two cups of chicken broth (or use chicken bouillon with water), add a quarter teaspoon each of garlic powder and ginger, an 1/8 teaspoon of pepper, and a teaspoon of cornstarch dissolved in a little water. When it’s hot, add a beaten egg and stir slowly and steadily till the cooked egg makes ribbons in the soup. Serve with chopped green onions if desired. A tummy warmer for a winter day. The box mac & cheese, don’t be afraid of it. It’s good if you add a can of ham, a can of green beans, and if desired, a spoonful of French onion dip. Mix one box of cake mix, any flavor, with a box of angel food cake mix. Store in a covered container in the pantry. When you want a serving, measure out 3 tablespoons of mix, 2 tablespoons of water, mix and cook for 1 minute in the microwave. It can be served plain or topped with frosting, fruit, and/or whipped cream. It’s as easy as 1,2,3. Make a batch of pop-up rolls and serve them with a big spoonful of fruit cocktail and a dollop of whipped cream. In my previous post, I gave my original recipe for a basic ice cream, which is pretty bodacious in its own right. But if you want to ramp it up a bit, here is a list of variations I’ve tried. You still make the basic recipe, then follow the directions below for different flavors. Try some of your favorites here, then when you feel comfortable, do some experimenting of your own. French Vanilla: Add 1 T. vanilla to custard and whipped cream mixture. Toasted Marshmallow: Cut down sugar just a tad in the custard mixture. Add 1 tsp. vanilla to custard and whipped cream mixture. Spread about half of one bag of large marshmallows in a foil-covered pan and toast in the oven till brown, about 15 minutes at 350 degrees. Add to finished ice cream, chop up, and mix in. Coconut: Add ½ tsp. vanilla and 2/3 tsp. coconut extract to custard and whipped cream mixture. Add ½ cup toasted coconut to finished ice cream before ripening. Banana Cream Pie: Puree two bananas in blender with some of custard mixture and add to rest of custard and whipped cream mixture with ½ tsp. vanilla. Make about three dozen tiny disks of pie crust (bake at 350 degrees for 15 minutes) and stir into finished ice cream before ripening. Cherry: Add ½ tsp. vanilla and 1 tsp. cherry extract to custard and whipped cream mixture. 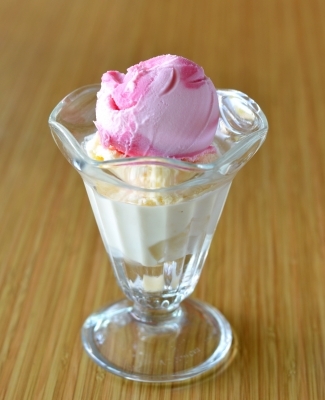 Add ½ cup chopped maraschino cherries to finished ice cream before ripening. Strawberry: Cut down sugar a tad. Add ½ tsp. vanilla and two cups sugared and pureed strawberries to custard and whipped cream mixture. Peach: Add ½ tsp. vanilla and 15 oz. can peach slices in syrup, pureed, to custard and whipped cream mixture. Watermelon Gelato: Add 1-2 cups pureed watermelon, half of a 3-oz. package watermelon Jello, and approximately 8 drops red food coloring and 2 drops yellow food coloring to custard and whipped cream mixture. Lemon Custard: Add small package instant lemon pudding and ½ tsp. vanilla to custard and whipped cream mixture. Orange Cinnamon Crunch: Add 1/3 cup orange juice concentrate and 1 tsp. cinnamon to custard and whipped cream mixture. Make a crunch by mixing ½ cup oats, ¼ cup flour, ¼ cup brown sugar, and 2 ½ T. butter. Spread on ungreased cookie sheet and bake at 350 degrees for 12-15 minutes. Cool, then stir into finished ice cream. Rum Ginger: Add 2 tsp. rum extract and ½ tsp. ginger to custard and whipped cream mixture. Pumpkin: Add ½ cup canned pumpkin, ½ tsp. vanilla, ¼ tsp. each of cinnamon, nutmeg, and ginger, and 1/8 tsp. ground cloves to custard and whipped cream mixture. Egg Nog: Cut sugar in half. Replace whipped cream with 1 ½ cups egg nog. Add 1 tsp. vanilla and ¼ tsp. nutmeg to custard and egg nog mixture. Amaretto: Add 1 tsp. almond extract to custard and whipped cream mixture. Chocolate Rum: Add ¼ cup cocoa to sugar before adding milk at the beginning. Add 2 tsp. rum extract to custard and whipped cream mixture. Chocolate-Marshmallow-Banana: Add ¼ cup cocoa to sugar before adding milk at the beginning. Puree ½ jar marshmallow cream and ½ banana in blender with some of custard mixture and add to rest of custard and whipped cream mixture. Chocolate Hazelnut Gelato: Add ½ cup Nutella to custard mixture while still hot. Add ½ tsp. vanilla to custard and whipped cream mixture. Mint Chocolate Chip: Add ¼ tsp. mint extract and 6 or 7 drops green food coloring to custard and whipped cream mixture. Add desired amount of chocolate chips to finished ice cream before ripening. Peppermint: Add ½ tsp. peppermint extract and 3-4 drops red food coloring to custard and whipped cream mixture. 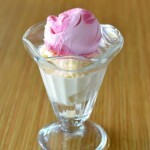 Add 1/3 cup finely crushed soft peppermint candies to finished ice cream before ripening. Rootbeer: Add approximately ¼ bottle (to taste) rootbeer concentrate to custard and whipped cream mixture. Pistachio: Cut sugar in half. Add small package instant pistachio pudding to custard and whipped cream mixture. Crème Caramel Toffee Crunch Gelato: Add ½ tsp. vanilla to custard and whipped cream mixture. Add ½ jar caramel topping and desired amount of toffee bits to finished ice cream before ripening and swirl gently for a marbled effect. Strawberry Cheesecake: Add ½ tsp. vanilla and strawberry jam to taste to custard and whipped cream mixture. Add chopped pieces of partially thawed strawberry cheesecake to finished ice cream before ripening. Chocolate Chip Cookie Dough: Add ½ tsp. vanilla to custard and whipped cream mixture. Add about a third of a tube of cookie dough, chopped, to finished ice cream before ripening. M&M Malt: Add ½ cup malted milk powder to sugar before adding milk at the beginning. Add desired amount of M&M’s to finished ice cream before ripening. See how fun this recipe is? My dad once ordered dill pickle ice cream at an ice cream parlor. I would never try that one, but if you want to, break a leg! I had never made ice cream before when I was married in 1994, but we received a frozen treat maker as a wedding gift, and thus began my foray into the world of frozen dessert making. After much experimentation I came up with this very tasty basic ice cream recipe that is smoothly perfect in texture as well as flavor. The recipe makes approximately a half gallon. Once you get the hang of it, this process goes really fast. I make it about once a week all summer long and on special occasions the rest of the year. The whole family loves it. Combine sugar, cornstarch, and salt in medium saucepan. Add milk and heat to very hot. Refrigerate egg whites. Beat egg yolks. Add one cup hot mixture, stirring constantly. Add all back into milk mixture and heat on medium, stirring constantly, to 160 degrees F. Cool two hours to overnight. Strain custard mixture. Beat egg whites till stiff peaks form. Whip cream, and add egg whites and cream to custard mixture. Freeze in ice cream maker. Ripen in freezer. Next post: I’ll share a boatload of different flavors you can make with this recipe. I love how, in the Old West, the Native Americans demonstrated industry and thrift by using all the parts of the buffalo they hunted. Besides making jerky and pemmican from the meat, they also used the dung for fuel, the hides for clothing and shelter, and the bones to make tools. I like to think that in my own small way, okay, very small way, I’m following their example. I often buy oranges, but my family rarely just peels and eats an orange. I usually end up juicing them. 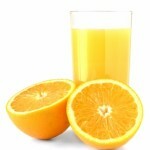 We don’t like much pulp in our juice, so I always strain it out. But I felt bad at how much of the orange’s insides seemed to go to waste. I hit on a simple idea that solves that problem. I slice the oranges in half and scoop all of their insides into a blender and blend them up. 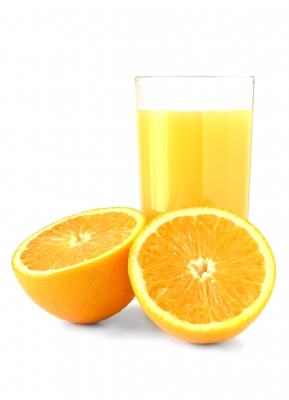 I strain out the juice to drink, then I freeze the remaining pulp. On another day, we will put the frozen pulp into the blender with milk and sugar to taste and make an orange julius. You can add a few ice cubes if you want to thicken it more. Pretty good if I do say so myself. Of course, if you really want to go Native American, you can also use the peelings for the orange zest called for in many baked goods or chopped up in orange marmalade. I do like orange marmalade but don’t make enough of it to use all my orange peelings. 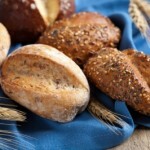 Want an inexpensive, quick dinner for those busy days, and maybe eating out isn’t an option? 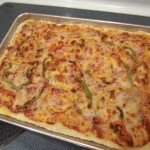 Try my Easy Peasy Pizza. 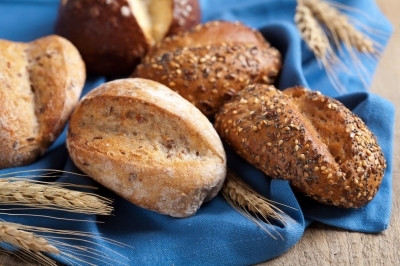 The basic ingredients are ones that, if you don’t keep them on hand, you really should so that you can always have a cheap, tasty dinner that’s also popular with kids. And you can even dress it up with various leftovers you need to use up. Mix all ingredients and knead for about one minute (really, that’s all). Place dough in oil-coated bowl and turn over so all of dough gets coated and place in warmed oven. Turn off the heat and leave the oven door ajar. Let rise for 20 minutes. When you take the dough out, start preheating the oven to 450 degrees F. Then use your fingers to spread the dough out in a jelly roll pan or cookie sheet that’s about 15 x 10 inches and coated with cooking spray. Don’t stretch the dough because you’ll get holes in it. Just gently press it outwards from the middle till it fills the pan. It won’t seem like it, but this dough really will fill the whole pan. Top with pizza sauce. Mix all ingredients together and cover top of pizza dough. Top with 8-oz. package of shredded Mozzarella cheese and bake at 450 degrees for 15 minutes. The basic pizza is yummy enough, but here’s where you can have some fun. Raid the fridge for goodies you can add to personalize your pizza. You can do pepperoni, sausage (cook first), olives, onions. I did one we loved that included thin-sliced zucchini, Roma tomatoes, and Parmesan cheese in addition to the Mozzarella. For another one I used some shredded chicken seasoned with garlic powder and oregano. 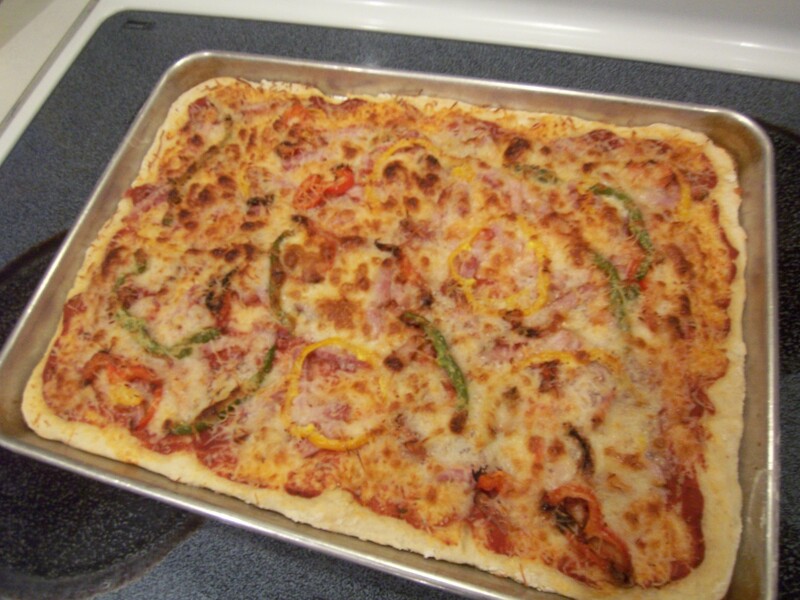 The one pictured above has julienne-cut ham and red, green, and yellow peppers on it. It’s a great way to use up leftovers you don’t want to throw away but which there are not enough of to serve your family. Bon appetit! Welcome to Valentine’s week on the Eagle’s Quill. Today I’ll share a yummy recipe for some feather-light cookies. Hang onto a few of them because we’re going to use them as part of a fancier-looking dessert later in the week. Beat egg whites, vanilla, cream of tartar, and salt till thick and foamy. Gradually add sugar and continue to beat till stiff peaks form. Add food coloring and mix in. Put meringue in a pastry bag fitted with a star tip and pipe out onto parchment-covered baking sheets in small heart shapes. Bake at 275 degrees for 30 minutes. Immediately remove cookies to racks. You can do other colors and shapes for other holidays.